I’m not going to lie – this was my first “tube” headband ever. That said, I’m really glad I tried it out, this has become my go to for all seasons. In the summer it’s a lightweight wristband for sweat wiping or a head covering to keep tenacious flies away. In the winter it’s a good neck warmer or light weight head covering. In between it can do any of the above – and more. Well, this probably doesn’t need a really in depth review – it does what it’s supposed to do and it does it well! The big upside for this one is that it is a fraction of the cost of a lot of other head bands out there and if nothing else could be a great back-up for your gear. 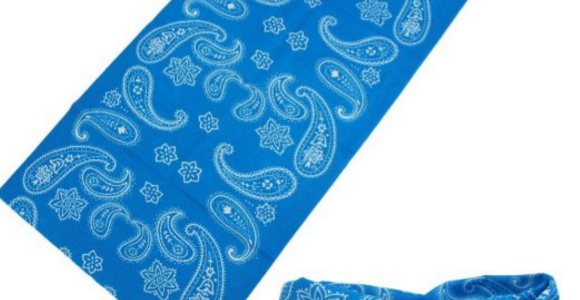 This headband cleans up quick and is washing and dryer safe. It’s ready to go right out of the dryer – just whip is out and roll it up, etc. For under ten bucks, this has been a great addition to my gear. 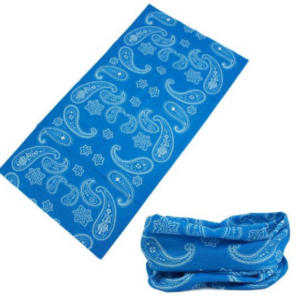 It's a blue paisley headband (super manly!) and it works well - if you need one, get it!